The modern world of rail is full of increasingly complex shapes, yet the technology used in handling these awkward and weighty items has been very limited to date. Slings, chains, hoists and ropes are all still used trackside for the handling and placement of masts, with or without complex gantry and crane systems. It seems bizarre that, in 2018, the rail industry is still using such primitive methods to lift sections and structures. From a health and safety point of view, having human beings underneath or in the vicinity of enormous and potentially lethal long swinging masts is far from ideal. So the industry needs a more scientific, safer and more economical way of handling these masts and structures. Sandhurst has been in the excavator-mounted attachment business since 1979, trading at first in hydraulic attachments and then renting them out. One of the founding companies of the sector, it has remained at the forefront of this new technology. The Sandhurst name is now synonymous with attachments and, over the years, the company has developed a strong relationship with the rail industry, carrying an extensive inventory of rail equipment reflecting its customers’ needs. He pioneered and encouraged the use of manipulators in rail engineering and maintenance, and the manipulator concept has now become a popular attachment for the accurate positioning and safe handling of stanchions, signal posts and more. However, the products currently available are limited by their design, to square and oblong sections up to 3.75 tonnes, or round sections up to 1000kg. In addition to these restrictions on the shape and size of the items being handled, customers also reported volatility in responsiveness, which Sandhurst identified as being caused by the number of hydraulic cylinders and their poor performance in co-ordination. There have also been problems with safety lookouts in the existing offerings, which make operators wary of using them. In response to these reports, Sandhurst set its engineering department a challenge two years ago, with a design brief to explore a next-generation manipulator with much more flexibility than anything seen before. Engineering director Neil Beard explained that the brief was to develop a product that could handle a multiplicity of forms, from square to circular to tapered, for carriers such as excavators and truck cranes with the capability to articulate and position loads up 5000 kg WLL (working load limit). Just taking the capabilities of various manipulators and combining them into one tool would, in itself, have represented a significant advance, but Neil wanted to go further than that. To pick up irregularly shaped items, the clamping elements would need to be independently actuated. Sandhurst’s engineering team began by sketching out different ideas, looking at how the legs should actuate in varying scenarios. The model they decided to run with would have three independent actuations – two leg pairs and a central ram – which would perform separately but combine to grab the work piece. Paired with this grabbing and clamping flexibility would be a tilt rotator, giving 360° rotation and tilting through 100° left and right. The design brief’s working load limit (WLL) meant that the team would need to complete finite element analysis (FEA) on components to ensure each would cope with static loading to 5,000kg. Further FEA and duty cycle testing was undertaken to ensure the durability of all components, including the moving parts. Although the grades of steel to be used were an important factor, as were the fabrication procedures that would be employed, intelligent design ensured that the attachment itself as a whole was both strong enough and load sensitive. With the manipulator attachment counting as part of the load on the machine, any weight saved would naturally increase lifting capacity. As a result, the geometry was optimised to ensure maximum durability and rigidity while saving weight. The final product would weigh in the order of 1,350kg, meaning that a structure weighing 3,650kg could be lifted and manipulated given an overall WLL of 5,000kg. In practice, this lifting capacity would vary depending on the radius in each particular case. To allow for careful handling, the clamping pressure would need to be adjustable within reasonable limits. The result of all this work is the Articulator 5000, a prototype of which was demonstrated to potential customers recently. With just two circuits, it’s an elegantly simple plug-and-play solution. Safety was a crucial factor in the design work. The failsafe is that the legs won’t move without a positive electrical current, so, if there’s a power cut, the legs won’t move. This means that, whatever the present situation in the workplace may be – whether an item is held or the Articulator is empty – it will be maintained. What’s more, an anti-burst valve is placed as close to the central pad’s cylinder as possible, so that, if there’s any change in hydraulic pressure, the legs will not move. Fitted to the unit are two electronic spool valves that are actuated by a control box which sits inside the cab and is fitted with both a visual and audio alarm. This confirms that the clamping element can then be activated. Cost efficiencies and time savings are likely to be substantial, considering that to erect and place a single stanchion is currently very labour intensive. 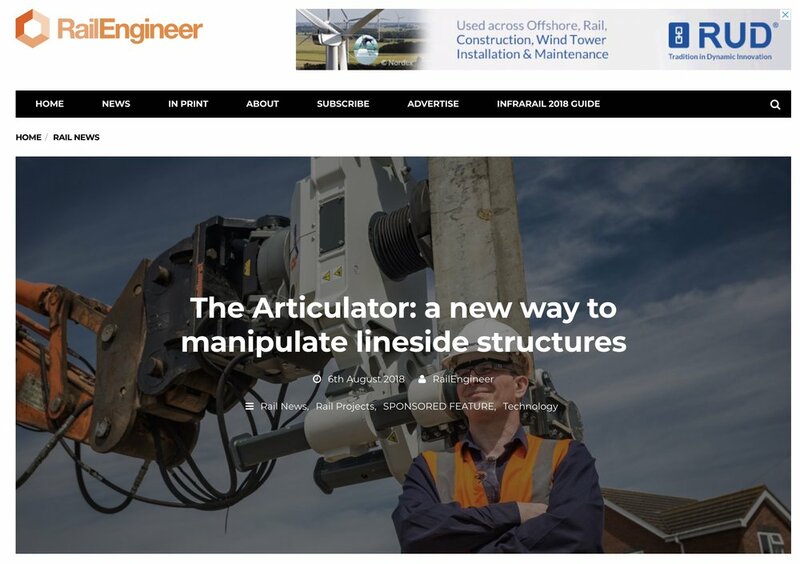 With masts for new lines being placed at 15 to 18 metre intervals, the use of a tool like the Articulator could increase efficiencies dramatically, with placement possible in a matter of minutes. The Articulator can be seen in action at the Sandhurst website, and has its own site, r-tick.com, where it is shown lifting long steel sections, awkward uneven and weighty structures and cumbersome concrete pipes. Demonstrated at a recent industry event, the Articulator drew a crowd of enthusiasts, with Neil Beard pleased to hear from rail industry colleagues that it was a very “well thought out” piece of equipment. Rail professionals were quick to spot the potential of the Articulator for multiple applications including electrification, the handling of stanchions and timber baulks, and placing concrete piles and pipes. At the same time, professionals from other sectors enthused over its potential for use in such areas as drainage and in erecting highways’ lighting structures. As the Articulator 5000 continues to go through comprehensive pre-production testing, including proof load testing and duty cycle testing, Sandhurst is reporting an overwhelming response to its website and advertising of the Articulator 5000. “There’s a sense that something like this is long overdue and I think a feel-good factor that an innovation like this, which will be so useful in rail and other sectors globally, was designed in Great Britain,” said marketing director Louise Dean. Sandhurst is inviting all who have displayed their keen interest, of whom there are many in all sectors, to a live demonstration day shortly after production begins. The venue will be courtesy of the Rail Alliance, which Network Rail will attend as part of its approvals process. Looking forward, there are plans for further models of Articulator, to handle smaller and larger weight classes and a cantilevered version for suspension from cranes. There will also be an ‘inclinometer’, for accurate positioning in the vertical or inclined planes. A dual-axis monitoring system, with a visual, cab mounted display, will ensure perfect placement of the loads handled which will be monitored from the operator’s position inside the cab. Tim Dean was keen to make the point that, as always, Sandhurst will be driven by its customer needs. “We listen to our customers, and provide solutions,” he said. Certainly, the Articulator represents a big leap forward for safe and precise handling, trackside or otherwise. Join us for The Live Demo. THE ARTICULATOR 5000 - WLL 5000kg.